Return to "Dispatches from the Armenian Revolution"
Anti-government protests in April 2018. A map of present-day Armenia. Armenian children struggling to keep warm. Bodies of those killed during the Armenian Genocide in 1915. The Armenian Genocide Memorial in Yerevan. An Armenian Genocide Remembrance Day march in 2014. A 2006 Armenian Army parade on Independence Day. Orphan children from the Armenian Genocide, 1915. Ashot Manucharyan, the Minister of Internal Affairs from 1991 to 1992. Azerbaijani refugees from Karabakh in 1992. Russian troops capturing Erivan fortress in 1827 during the Russo-Persian War. A boy and his father bringing home firewood during the energy crisis of the 1990s. 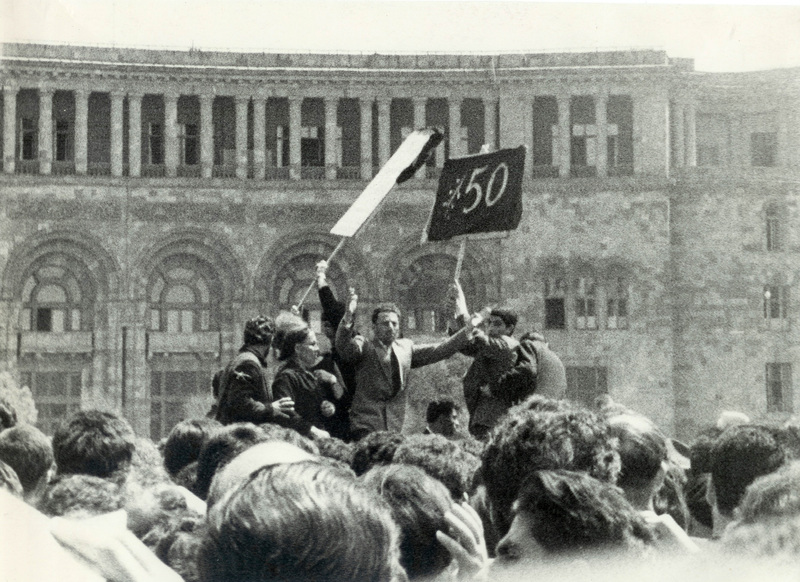 Demonstrators in Yerevan calling on the Soviet Union to officially recognize the Armenian Genocide in 1965 [Courtesy of the Armenian Genocide Museum-Institute, Yerevan]. Celebrations after the September 21, 1991 referendum. Karabakh Committee member Ashot Manucharyan on the left with Ashot Dabaghyan on the right (left) [image courtesy of Bagrat Dabaghyan]. Karabakh Movement demonstrations in 1988. Karabakh Movement demonstrations in Yerevan, 1988 [photo by Ruben Mangasaryan]. The inauguration of Armenia’s first president, Levon Ter-Petrosyan, in 1991. Protesters in Mashtots Park in 2012. Photograph of the Biblical Mount Ararat, a symbol of Armenian national and spiritual identity [photo by author]. A 1994 map showing the Nagorno-Karabakh region and the wider conflict area. A poster featuring Armenian revolutionary leader and now Prime Minister Nikol Pashinyan in 2018 [photo by author]. The first day of Ukraine’s Orange Revolution in 2004. Russian President Vladimir Putin and Armenian President Robert Kocharyan in 2004. Raffi Hovannisian in Yerevan’s Freedom Square in 2013. Demonstrations at Republic Square in August 2018 [photo by author]. Republic Square in Yerevan in May 2018. Demonstrators in Tbilisi, Georgia during the Rose Revolution in 2003. President Serzh Sargsyan at a NATO meeting in 2014. Anastas Mikoyan, Joseph Stalin, and Grigori Ordzhonikidze in Tbilisi, Georgia in 1925.